Winter is coming and the days are getting shorter. You may have heard friends and neighbours complain about a variety of ‘bugs’ doing the rounds, including the common cold. According to the Washington Post, the dropping temperatures are friendlier for cold and flu viruses. Autumnal allergens from leaf mould and other spores bring back the hay fever of springtime. We also spend more time in indoor crowded spaces where it is easier to come into contact with other people’s germs. 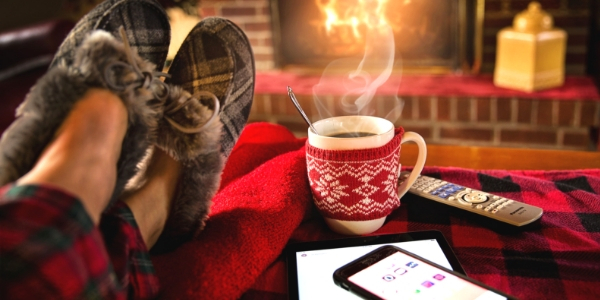 But, staying well in winter isn’t just about avoiding colds and flu. For many people, the fewer daylight hours are a big challenge. Seasonal Affective Disorder is a recognised condition, but not everyone suffers from it to the extent that they have a clinical diagnosis; yet they are aware that the dark days can get them down. What can we do to improve our feeling of general wellness until spring returns again? Here are four tips that will hopefully help to make winter just as enjoyable as the other seasons. One way to break up the winter months and have that all-important ‘something to look forward to’ is to plan a winter sun holiday. You really don’t need to travel that far: Tenerife and the other Canary islands have plenty of sunshine in winter, and even southern Spain sees visitors sunbathing and playing golf. Sometimes it isn’t the heat that is important; it’s the sun and longer daylight hours that have a refreshing effect. In many ways, winter offers us a chance to slow down and become more introspective. In our society there is a general feeling that taking time out, so to speak, goes against the grain. We feel we should be busy, busy, busy, or there’s something wrong with us. There are meditation classes of many varieties available in all areas of the UK, where you can learn techniques that help to reduce any anxiety you may feel during this season. You can also teach yourself with books, YouTube videos and downloadable apps. Like animals that hibernate in winter, the season is an opportunity to catch up on the sleep you might have missed out on during summer. According to the Royal Society for Public Health (RSPH), the average sleep time in the UK is 6.8 hours, which is an hour less than what is recommended. Having a poor night’s sleep also impacts concentration and memory. It makes us more inclined to feel stressed and choose unhealthy foods as a quick comfort fix. If you have sleep problems, use the winter months to experiment with routines that encourage a less fitful sleep. You will find helpful ideas at The Sleep Foundation and The Sleep Council UK. During colder weather our natural inclination is to stay indoors. But, that can lead to feelings of isolation and even depression. One way to beat the winter blues is by being more social. It’s an ideal time to choose to do an evening class in a new subject for you, where you will meet new people. With Strictly Come Dancing being back on our televisions, why not choose a dance class? This provides exercise that releases endorphins that enhance your mood, as well as offering interaction with other people. Book clubs, knitting and sewing circles are other great winter hobbies and there are many more to choose from. Otherwise, look after your general health and get out in the sunlight when you can. When we feel good mentally, our body stays healthier. If we think ‘winter happy’ instead of ‘winter misery’ we’ll enjoy greater wellness, and that’s something we all want.